"Roshogulla bhishon meetha, khao, khao naa!!" Remember this line from the old Government sponsored advertisement to promote National Integration? One little boy forgets his lunch box, and immediately all the other children offer some of their lunch to him. The Punjabi kid brought samosa, and the Bengali kid brought rasgullas and he said that line!! This is what comes to my mind every time I make this delicacy. Before this recipe, I was under the impression that Bengali sweets are hard to make. It doesn't seem like that anymore! I learnt this one first form Gurjar Aunty, and later found it in a recipe book of mine - So much for collecting recipes!! Goes to show I don't try out enough of them! Saffron strands (Optional) - 1 tsp. 1. If using cow's milk - Heat the milk, cool completely and remove the cream. If not proceed directly to the next step. 2. Heat milk to boiling point. Put off fire. Pour the dilute vinegar little by little into the milk stirring very slightly till it curdles, and the whey separates. 3. Now strain the paneer so formed through a clean muslin cloth. Wash the paneer under running tap water breaking the lumps with soft fingers till it turns cold. 4. Hold and press the bundle to get rid of excess water and invert the paneer onto a clean bowl. 5. Mash the paneer with your finger tips first and knead it till it gathers into a soft smooth ball. 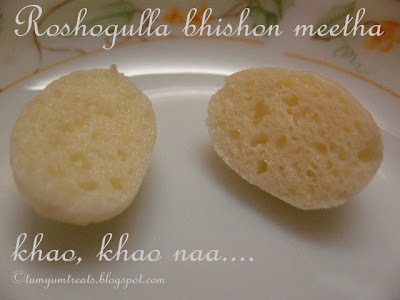 Pinch out marble sized paneer lumps and roll with slight pressure into balls without any wrinkles or seam. This will form angoori golas. You may form bigger balls for bigger rasgullas. They will double after cooking. Mine formed 4 big balls and 31 small ones. 6. Cover with a wet cloth to keep the balls from drying. 8. Drop the rasgullas gently into the syrup while it simmers on slow fire. 9. Cover the cooker with lid and place the whistle on top. Keep on high fire for one whistle and turn off. Let it cool completely. 10. Open and transfer the swollen rasgullas into a bowl. 11. Refrigerate and serve. Warmed rasgullas are equally tasty. Here is a picture of a halved rasgulla. You should find the jaali (Holes as in cheese) pattern after it is cut. This indicates that they have turned out right. Also they will feel slightly chewy. Now, Isn't that easy? It gets done in about 40 minutes from the making of the paneer to the cooker cooling down. The only big wait is the refrigerating time! 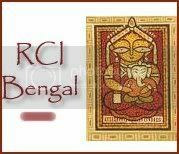 This post is my entry for RCI-Bengal (On till 15th April) hosted by Sandeepa of Bong Mom's CookBook.